When talking education with John Spencer, you’ve got to discuss empowering students. Of course, you also have to talk about project-based learning, design thinking (John calls this “The Launch Cycle,” see embedded YouTube video below), and creative risk-taking. That’s why we conducted this 10-hour-long interview with John. Okay, not really. But seriously, we could have. He’s got the stamina, the ingenuity, the insight, and the ideal others-first teacher mentality. We love John for all of these. ATH Episode 10 features John Spencer, author of Launch, Empower, and Making Learning Flow. John’s also a college professor and podcaster. We strongly recommend checking out his podcast, The Creative Classroom. This episode has another bonus. Since John encourages teachers to empower their students, Cade and Michelle sought interest among their students and had four of them take over the episode. Students-turned-podcasters Josh Whaley, Nathan Robbins, Grant Reeder, and Kristina Dyda shine brightly in their newfound podcasting stardom as they host the show, interview a guest, and offer valuable commentary which includes stories of their own experiences with design thinking at their high school. These empowered students took it upon themselves to interview Theresa Shadrix, a colleague of Cade and Michelle, who is an IDEO Teachers Guild fellow for 2017-2018. Theresa has led the way in teaching other teachers about design thinking and modeling the process in her own classroom. Below are some notes on what’s discussed throughout this episode. 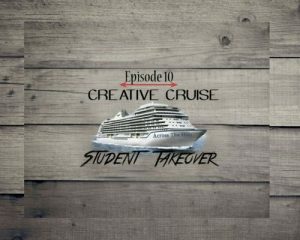 Listen to “ATH E10: Creative Cruise (Student Take-over Edition)” on Spreaker.